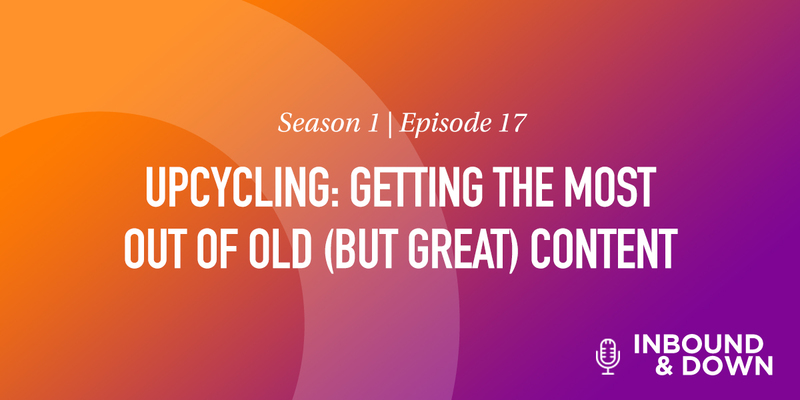 On this episode of "'nbound & Down,' co-hosts Jon Sasala and Danielle Esposito of Morey Creative (along with a very special guest) discuss how to get the most out of your content through "upcycling." They discuss how to do it, why it's beneficial, and explain how they've upcycled their clients' content. Creating new content is not only time-consuming, but expensive. So, why not revisit the amazing content you’ve already created and repurpose it? Yes, you can do it, and no, it's not being lazy. It's called "upcycling," and is extremely effective. In simple terms, upcycling is converting your existing content into multiple formats to make it as, or even more, valuable. "You're taking your most successful pieces and figuring out new ways for your audience to consume it," explains Danielle Esposito, Morey Creative's Senior Strategist. It extends reach without oversharing your content. It enables you to focus on creating the best content, rather than creating lower-quality content more often. It respects the various learning styles of your audience. So, how do you upcycle? You've created this awesome, really comprehensive, 10x blog post packed with valuable information. It's been really successful. It's gotten a ton of views, new contacts, and has even generated some sales. Don't just leave it as is, upcycle it! Turn your content into an infographic, podcast, or video. Extract quotes or statistics to share on social media. Convert your blog into a slideshow on Slideshare. Turn a bunch of related blogs into an ebook. Change the industry vertical or audience. But, this isn't all you can do. There are so many different ways to add extra value to your content, so let us know how you've successfully upcycled (or plan to)! You spent so much time, energy and money creating successful content, so upcycle it into multiple formats to reach as many eyes as possible. Upcycle only your most successful content. Don't upcycle (or write) crappy content!